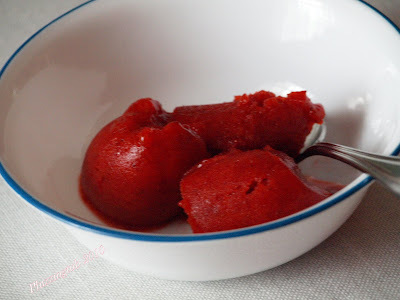 So, over the summer I decided to pull out the ice maker and try my hand at some sorbet. I am not able to eat ice cream very often so every once in a while I like to have some sort of frozen treat. We had quite a few left over strawberries at one point and I figured why not give sorbet a try. I have to say this was a delicious, refreshing treat! Fast to make, set up nicely in the freezer and was such a wonderful treat. I used and followed the recipe from Joy of Baking without a problem. Place the sugar and water in a small saucepan, over low heat, and stir until the sugar is completely dissolved (about 3-5 minutes). Boil the mixture for one minute then remove from heat. Pour the sugar syrup into a heatproof container, and place in the refrigerator until completely chilled (about an hour or so). Once the simple syrup and pureed strawberries are completely chilled, combine the simple syrup with the pureed strawberries. Transfer the mixture to the chilled container of your ice cream machine and process according to the manufacturer's instructions. Once made, transfer the sorbet to a chilled container and store in the freezer. Per Serving (excluding unknown items): 107 Calories; trace Fat (2.3% calories from fat); 1g Protein; 28g Carbohydrate; 2g Dietary Fiber; 0mg Cholesterol; 2mg Sodium. Exchanges: 1 Fruit; 1 Other Carbohydrates.